Choosing the right paint colour is just one half of the planning process. The liquid in the can should be just as important to you as the colour it will be tinted. Resist the temptation to go with the cheapest paint. Just like fine wines, there is good paint, great paint, and amazing paint. With a simple upgrade, you’ll quickly understand the difference – and you’ll wonder why you ever used anything else! These are five important factors to keep in mind when selecting your paint. How deep a colour have you chosen? How exposed to the elements will it be? All Benjamin Moore paints are formulated with custom resins and tinted with proprietary Gennex® colorants which ensure colours that remain vibrant for years to come. Some are specially formulated to hold richer, deeper colours better than other, like Aura Interior Paint, whose proprietary ColourLock technology means richer, truer colour. This quality is important if you’ve chosen a deep colour, or are trying to cover over one. How many coats should you plan for? Benjamin Moore paints are formulated to be “high hiding”, easily covering over flaws or dark colours and getting the job done quickly. 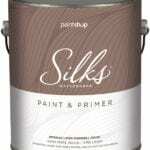 Silks, Regal Select and Aura are all “self-priming” paints, meaning they are a Paint & Primer in One. This makes a big difference for coverage. 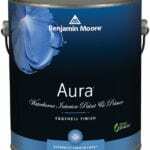 Aura, for example, can achieve amazing one coat coverage with most colours. 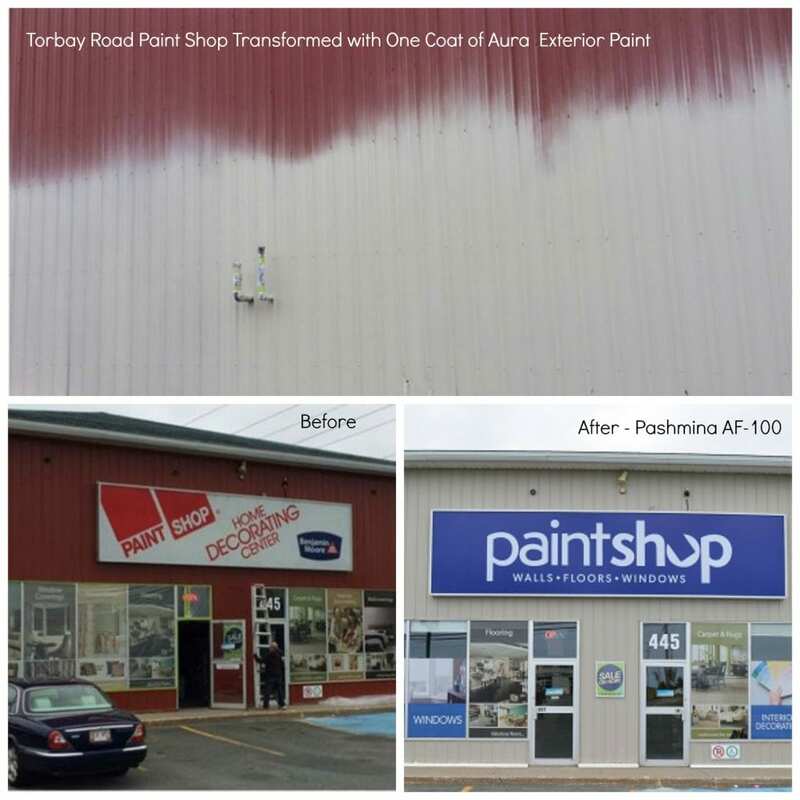 Take our Torbay Road Paint Shop, for example. That went from barn red to Benjamin Moore Pashmina in just one coat of Aura Exterior Paint. Even we were impressed! You’ll want to pay attention to this factor for high traffic spots like porches, kitchens, hallways and trim. Benjamin Moore paints are formulated to stand up to repeated cleanups without compromising colour richness or finish. Washability is also an important consideration when selecting the paint finish (eg. Eggshell, Pearl, Gloss). The shinier the finish, the easier to clean it will be. 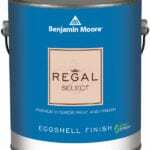 Regal Select is considered one of the most “scrubbable” paints on the market, so mention that brand at your local Paint Shop if you think this might be a concern. are all Paint and Primers in One. VOCs are Volatile Organic Compounds, or harmful chemicals responsible for paint fumes. A low-VOC paint contains 50 grams per liter or less of these chemicals, while a zero-VOC paint contains 5 grams per litre. Benjamin Moore’s Gennex colorants contain zero VOCs and exceed some of the industry’s strictest environmental standards, while keeping its exceptional performance as paint. 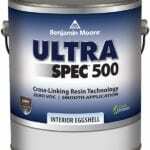 Ultra Spec is a good, user-friendly paint with Zero VOCs, a great choice for the entry level painter. Next time you need to pick up a can of paint, keep these five factors in mind for a good, great, or amazing painting experience!